ww2dbaseThat's what General Anthony Clement McAuliffe said to a German group who demanded the surrender of the encircled 101st Airborne at Bastogne during the Battle of the Bulge in 1944. "There is only one possibility to save the encircled U.S.A. troops from total annihilation: that is the honorable surrender of the encircled town. In order to think it over a term of two hours will be granted beginning with the presentation of this note." ww2dbaseHe pondered for a few minutes and then told the staff, "Well I don't know what to tell them." ww2dbaseHe then asked the staff what they thought and I spoke up, saying, "That first remark of yours would be hard to beat." ww2dbaseMcAuliffe said, "What do you mean?" ww2dbaseI answered, "Sir, you said 'Nuts'." ww2dbaseAll members of the staff enthusiastically agreed, and McAuliffe decided to send that one word, "Nuts! ", back to the Germans. ww2dbaseThe German group didn't understand the message initially: "Is the reply negative or affirmative? If it is the latter I will negotiate further." ww2dbaseAn American clarified it for him. "If you don't know what 'Nuts' means, in plain English it is the same as 'Go to Hell'. And I'll tell you something else, if you continue to attack we will kill every goddamn German that tries to break into this city." 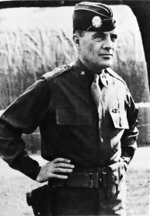 ww2dbaseGeneral McAuliffe's response came to typify the "can-do" American attitude, despite the tough circumstances, demonstrated so ably by 101st Division in Bastogne. He was awarded the Distinguished Service Medal for leading the defense of the city against overwhelming German strength in numbers and materiel. "Years later [I] asked Taylor how he would have replied to Luttwitz [the German General making the demand] had he returned in time for the surrender ultimatum. Taylor's answer was that because this was an international communication he would have replied in French, the proper language of diplomacy, and would have said something like, 'These are still the Ardennes, but this is no longer 1940.'" ww2dbaseGeneral Taylor reached the Division three days after the ultimatum was delivered, and by then "Nuts!" went "out to the world and into history." ww2dbaseMcAuliffe went on to command the 103rd Division in January 1945 until the end of the war. After hostilities ended, he held a number of command posts in the military, including Commander and Chief of the U.S. Army in Europe in 1955. He retired in 1956.
ww2dbaseSources: 103rd Cactus Division, www.dropzone.org, National Archives, Behind Hitler’s Lines. 2 Jul 1898 Anthony McAuliffe was born. 11 Aug 1975 Anthony McAuliffe passed away. Typografical error. McAuliffe went on to command the 101st Airborne Division, not the 103rd. Actually, 103rd is correct. McAuliffe was transferred from 101st Airborne Division to 103rd Division in Jan 1945.
nowonder they call them the GREATIST GENERATION.now thats true heros. 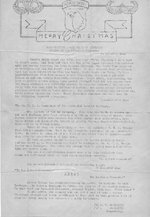 According to the novelist and military historian, Charles Whiting, General MacAuliffes's scornful reply of "Nuts" made in response to the German offer to surrender after his division became surrounded at Bastogne may not be strictly accurate. Actually, he retorted something much more cruder, but fortunately for the legend, his PR man censored the expletive in time. The original would most certainly not have been appropriate for inclusion in High School history books.